Cousins Bila and Nopoko, ten-year-old boy and girl, are best friends. While tending to the grave of Nopoko's mother they spot Sana, an old woman who lives on the outskirts of their village. She helps Nopoko in a game of hide-and-seek and, recognizing her innate kind-heartedness, Bila starts to visit her regularly and gives her the affectionate name Yaaba (grandmother). However the rest of the village considers her a witch and other boys throw stones at her. On the way back from bathing at the local watering hole Bila and Nopoko get in a scuffle with these same kids and Nopoko is cut with a rusty knife. When she falls ill her parents think it's just malaria, but Sana tells Bila she suspects tetanus. 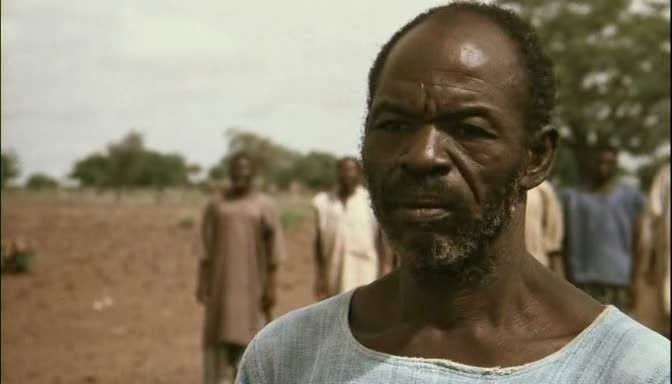 Bila's superstitious father invites a medicine man to heal Nopoko, and the charlatan claims that Sana has stolen the girl's soul and must be driven out, leading the villagers to burn down her house. Nevertheless, Bila convinces Sana to make a long journey for proper medicine. Woven with the primary story are other narrative threads including the bickering of neighboring families and a scandalous love triangle. Koudi, who is married to a friendly but impotent drunk, is having an affair with Razougou, a former flame, and it's only a matter of time before they are caught. Bila is friends with both Koudi and her husband, but learns not to take sides. Idressa Ouedraogo is one of my favorite African directors, in part because of his skill at taking the daily concerns and domestic dramas of village life and structuring them into a satisfying, small-scale and yet wide-ranging story. From the simple incidents of an unremarkable childhood he mines the important revelations of growing up, of learning friendship and fairness, the fragility of life, the fickleness of love, the multiplicity of truth and inevitability of death. Yaaba is also anchored by two incredible child actors, who give performances that capture both the sweetness and meanness of youth and the speed with which they can toggle. But Ouedraogo is an optimist and a humanist, and he leans towards a generous and forgiving warmth, saving his condemnation, and even that's probably too strong a word, for those who should know better: the worst of the vain, superstitious and dictatorial adults. Yaaba is about as apolitical as you can get, but if there's any agenda it's in its preference for the wisdom of children, mothers and the elderly over the dubious moral authority of men. Mostly, though, Yaaba doesn't feel like it's about messages so much as a memories; the best and worst of your formative years. It's attitude is encapsulated by the first and last image of Bila chasing Nopoko across the rich red earth.